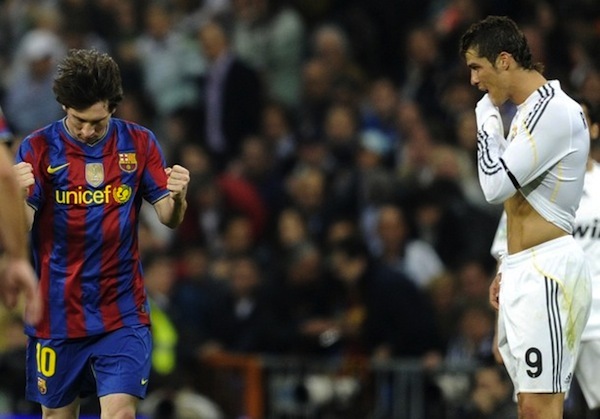 With el Clasico less than a week away and both Lionel Messi and Cristiano Ronaldo in superhuman form at the moment, it's high time the never-ending debate over who is better finally gets settled. The following is a transcript of how we imagine the verbal smackdown between the two footballers themselves would go. Ronaldo: I'll start -- I'm better. Leo has a cheap haircut. I win. Messi: But I won the Ballon d'Or. Ronaldo: I won it before you so that makes me better. Also, I've been with a bucket load of famous hotties and I'm pretty sure you're a virgin. Messi: Haha what's that? Like olive oil? Pele: Heeeeeey what's going on in here, guys? Ronaldo: This doesn't concern you, old man! Messi: I scored three goals against Almeria over the weekend! Ronaldo: Almeria stink. I scored three goals against Athletic Bilbao. And I scored a goal at the World Cup. Messi: Yeah, with your back. You looked like a seal hahaha. Ronaldo: Don't laugh at me! You will marvel at my abs! Messi: Can't, sorry. Too busy playing with my millions of Legos that you don't have. Ronaldo: Why would I want Legos? I have a baby. And his name is also Cristiano. Because that is the best name. Just ask science. Messi: Maradona says that science is a lie like Italian taxes and talking monkeys. Ronaldo: I just talked to Maradona the other day and he said I'm better than you. He also said that you smell like goat cheese. Messi: I petted a goat once! Ronaldo: I petted Paris Hilton once. Messi: This is stupid. We can both be the best, Cristiano. I really don't think it's possible to say one of us is better than the other. We're both really good and we should just appreciate that. Messi: Oh. Then lets ask Mr. Pele. Mr. Pele, who is the best, me or Cristiano?